The first time I wrote about Credit Karma was in January 2008, shortly after the web site which provides its customers with free credit scores, was launched. Initially, I was a little skeptical about their service, because they are giving one of the most important pieces of personal information, the credit score, for free, while all other providers charge a fee for one to obtain his/her own credit score. Somehow, Credit Karma just sounded too good to be true. After holding off for more than a year, I finally decided to give Credit Karma a try last week. The process was smooth and before long I was able to see my credit score after confirming that I authorized Credit Karma to pull it for me. I guess all the cards I own are garbage because I have too many accounts but not enough premium cards And as of the last reason, if I understand it correctly, my mortgage account balance can be considered low comparing to my combined credit limits, not too high. As you can imagine, I am not happy with the explanation. But considering that the score is free and it’s not the FICO score that lenders are using, I am not going to complain too much about it. And unlike other credit score services, from which you only get the score at the moment you requested it and you will have to pay again if you want an update later, Credit Karma allows its customers to update their scores, again at no cost. That’s very sweet because, in my opinion, the change of score is as important as the score itself. 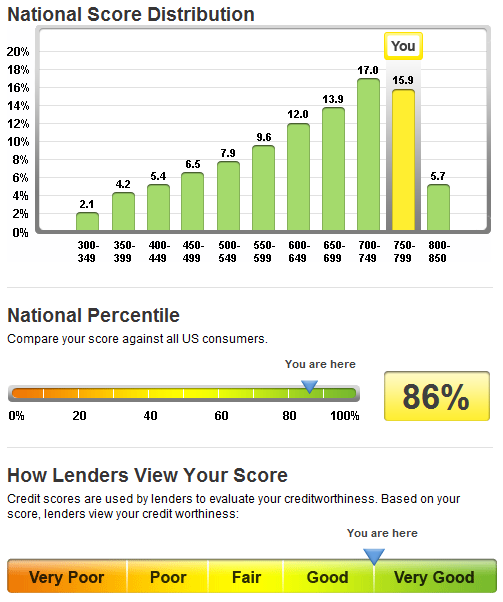 In addition to credit scores, Credit Karma also let its customers compare their scores against others to see where you are and how lenders see you if they were to provide you with a loan product today. These are pretty standard services that you can get from any credit report agency. What’s new at Credit Karma is actually is the comparison among Credit Karma users, in the same state where you live, at your age group, even in same email domain (you will need to provide your email address when registering). As you can see, there are many actions you can take to see how your score will be affected. While taking most actions listed above will certainly hurt your credit score, not improve it, it serves as a reminder that in order to maintain a good credit history and credit score, one has to be responsible. Overall, I think as a free service, Credit Karma provides some value to its customers, even though the credit score isn’t the really the one used by lenders. Since Credit Karma allows users to update their scores (the score can also be updated automatically once every month, thus can be used as a free credit score monitoring service), users can stay on top on their credit information. Nowadays, credit score and credit history are vital for consumers. With the help from Jessica Swain of Atomic Public Relations, I recently had an interview with Credit Karma CEO Ken Lin on some questions I have regarding the general services provided by Credit Karma. Together my review above, I hope the interview will give you a better idea about Credit Karma. Q: Can you tell us a little bit more about Credit Karma and what Credit Karma is offering? A: Credit Karma is a completely free pro-consumer service that offers users free access to their credit scores, a range of interactive financial resources, and tools to help track and optimize a users credit score. Q: I first learned about Credit Karma in early 2008, but I didn’t try to get a score myself until recently. My main concern is giving out my personal information to a new company I never heard of. How does Credit Karma protect its customer’s identity? A: Credit Karma uses the same encryption and security precautions as leading financial institutions. In addition, we proactively delete all user account information and social security numbers. Those sensitive pieces of information are never stored on our servers. Q: Does Credit Karma calculate its own credit score? If it doesn’t, then which credit score (FICO, VantageScore) does Credit Karma use? Does Credit Karma process the score before showing it to a customer? Will a customer see different scores when he/she gets the score directly from one of the three credit reporting agencies? A: No. Credit Karma purchases its credit scores from TransUnion, one of the three credit bureaus. This ensures that our credit score is the same model used by dozens of credit monitor sites and lenders. Our credit score is the TransUnion TransRisk score. The TransRisk score is a model developed and used by TransUnion. It is the same score used by dozens of credit monitoring sites like TrueCredit or PrivacyMatters use for their consumer credit monitoring services. As you suggested, there are multiple scores between bureaus. We hope that one score provides a better user experience and less confusion. Q: For people more familiar with FICO score, how can they translate their Credit Karma score to FICO score to have a better idea where they are? A: There is no direct translation algorithm. Consumers have to understand that there are hundreds of different credit scores in use. This makes it tremendously difficult to compare and contrast scores. Even within FICO they have dozens of different scores that lenders use in the underwriting process. That is why we use one consistent score so consumers can compare their everyday actions with their same score over time. Consumers need to be aware that all credit scores are created from the same data (credit reports) using the same mathematic process (logistic regression). Those two factors make credit scores highly correlated, meaning movement in one score is highly indicative of movement in other scores. Q: Does getting my credit score through Credit Karma actually end up hurting my credit score? 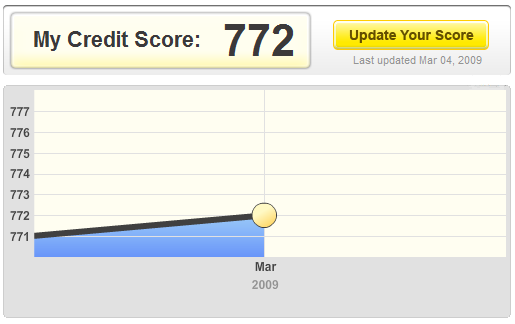 If I ask Credit Karma to update my credit score once every month, will that hurt? A: No, and this is a very common question and often causes concern among consumer. Credit score requests from the consumer about their own score is known as a soft inquiry. Those inquiries do not affect their score. It is hard inquiries that negatively affect scores. Hard inquiries are credit requests from lenders such as credit card companies, mortgage lenders, and banks. Q: Another concern I have is how long Credit Karma can keep offering its customers free credit scores. We recently saw a broker almost abandoned completely its free trade offer. As a business, how does Credit Karma make money to maintain its business model? As an customer, I certainly don’t want to see what’s free now becomes fee based later. A: We and our sponsors believe access to one’s credit score is a fundamental consumer right. As such, we have built the business to be always free. Unlike other financial services companies, we have a tight control on our expenses and don’t spend much on marketing. We grow through bloggers, journalist, and users and this helps keep us highly competitive. Q: How Can Credit Karma help consumers in this economic environment? A: In this economic environment, good credit is more important than ever. Credit Karma can be a valuable resource to help manage your credit score with expert advice and interactive tools. In addition, our service helps consumers monitor their credit for identity theft, something on the rise in these bad economic times. Q: Finally, do you have any advice for us? A: Good credit is probably one of the most important factors of a consumers financial health. With it, consumers have many more options available for financing needs and can save thousands of dollars in interest over their lifetime. We hope consumers will embrace the value and start using credit more wisely and more to their benefit. Thanks Ken for your time! Now, are you interested in using Credit Karma to get your free credit score? The major comments I received from the site is that I have a short credit history and that I have a large amount of debt relative to my credit limit. I suppose that is a good assessment, except for the fact that I do not have a credit card. I use my debit card exclusively (or cash) so my credit history is exclusively student loans and car loans. This brings me to my second point, I have a no revolving credit so of course everything is going to look large relative to that. Most interesting to me was the “credit simulator” which allows you to take your current credit situation and predict the relative effects of certain events. So I took into account the above and since I am interested in a rewards card if there are some real benefits to me I checked out what a moderate line of credit on a new card would do to my score. Turns out it would kick it up about 5 of these arbitrary points. Apparently it wont hurt me to check into a credit card but I am wary that this scoring system may (as their policies explicitly state) “emphasize or de-emphasize” certain pieces of information when calculating a score. Since the primary product on the site is credit card offers I take this to mean that they look favorably on opening new accounts. I suppose it wouldn’t really hurt me to get one, but I don’t see an offer that entices me anywhere on the market though I will check back with them from time to time and see if things improve. For now paying with a Mastercard/Visa (ING and Everbank) approved debit card, and using the credit button and signing for receipts affords me all the benefits of credit card ownership sans credit line. Now if only I can remember to check back in a month or so to see if there is any score drift! Just as a quick check back, my scores showed a 20point deterioration on Credit Karma (month to month), all other things being equal (and an on time month as usual). When I applied for a mortgage they sent me my FICO (and other) scores in the mail, and there was over a 70 point (in my favor) difference. Being off by these 70 points was pretty serious, its 12% of the scoring range. I know FICO is a proprietary score, but come on, being off by 12%? That’s pretty intense. Caveat emptor, use the karma service to alert you to sudden drops which might indicate errors in your report and stay away from using it as a guidepost for what your FICO scores really are. @Adam Since every lender uses FICO score, the credit score Credit Karma is giving away for free doesn’t really matter if you only look at the score itself. However, as you said, it’s the trend of where the score is going that needs the attention. Even though every score is developed with different ways to do the calculation, they should all share some common elements to make them valid. 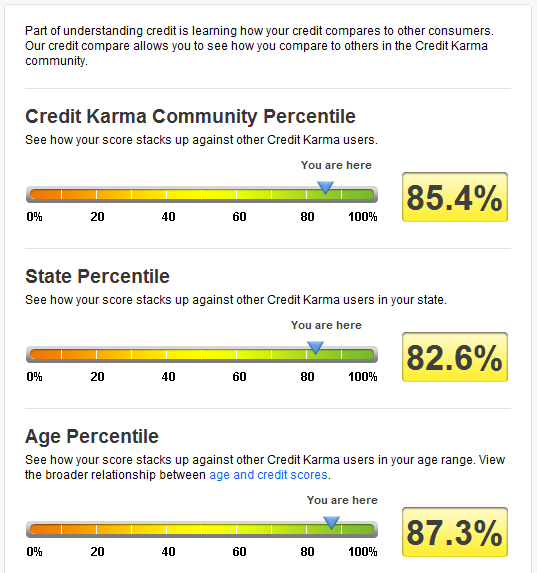 I am using Credit Karma to watch the trend, nothing else. I just looked at my “Hard inquiries, and it is showing 4, there is nothing other than Credit Karma that I have looked at my credit for. It is January 7th, 2011…..Maybe I missed something in their details. I update my credit score with Credit Karma every month in the past two years and I never saw a single check showed up in my credit report.